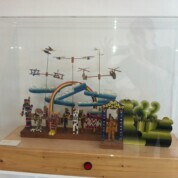 Cabaret Mechanical Theatre is an exhibition of contemporary automata. Displayed in glass cases throughout the small gallery, the quirky and brightly coloured machines whirr into action at the press of each red button. My 13-month-old son was transfixed by the machines and watched as other visiting children went from case to case excitedly pressing the buttons and waiting to see how each automaton would surprise them. The subjects of the automata were quirkily charming, from a complete tiny circus to a man eating spaghetti in the bath, via the Queen giving the royal wave and a hopping jackal. 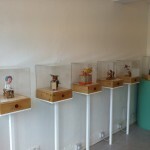 Cabaret Mechanical Theatre is at Space Station Sixty-Five, East Dulwich, until 7th September 2012. Brilliant fun – especially for children, who always love to press buttons! Admission is free but donations are welcome. 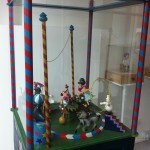 One or two of the automata require a ten or twenty pence piece to operate. Open Tuesday to Sunday, 11 am to 6 pm. Address: Space Station Sixty-Five, 65 North Cross Road, London, SE22 9ET. By train: The nearest station is East Dulwich.